The first buns of this kind I ever had came out of a trailer with no wheels on it in Austin, Texas in a dusty lot behind a club with a terrible band playing way too loud. This trailer, called East Side King, is operated by Paul Qui, who at the time had yet to compete and win Top Chef 9. My buddy Chris and I got there a little before they opened and waited in the loud, dusty lot for what seemed like ages. The wait was worthwhile as I was introduced to the Asian bun: a taco-ish contraption made from puffy, cloud-like flour stuffed with all manner of tastiness. 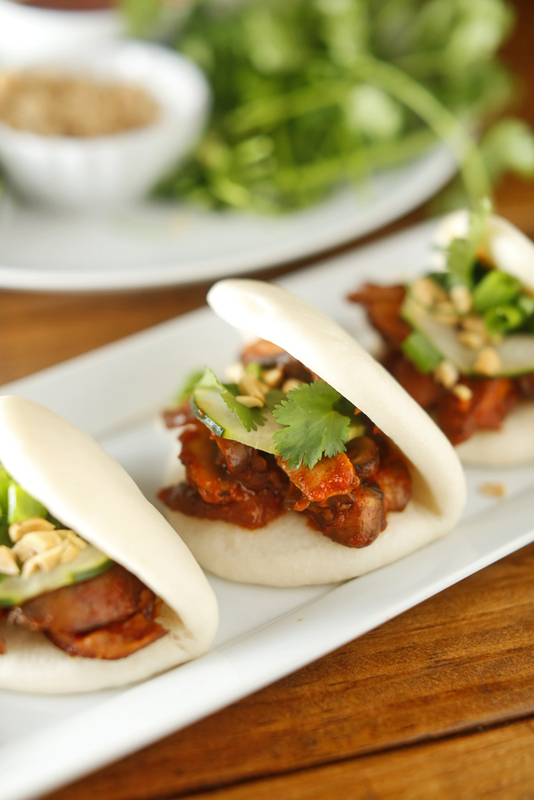 Fast forward a few years and we are reminded again and again of the tasty Asian bun most recently by our friend Andrew over at Acre in East Memphis; he has put pork steamed buns on the bar menu there. I hear they are incredible; Amy certainly thought so. So, we set out to make a vegetarian version at home that we could share with you. You can also find Korean BBQ sauce at the Asian market, but we prefer to make our own to avoid fish sauce and corn syrup. If you can find a good vegetarian version of Korean BBQ sauce, by all means use it! 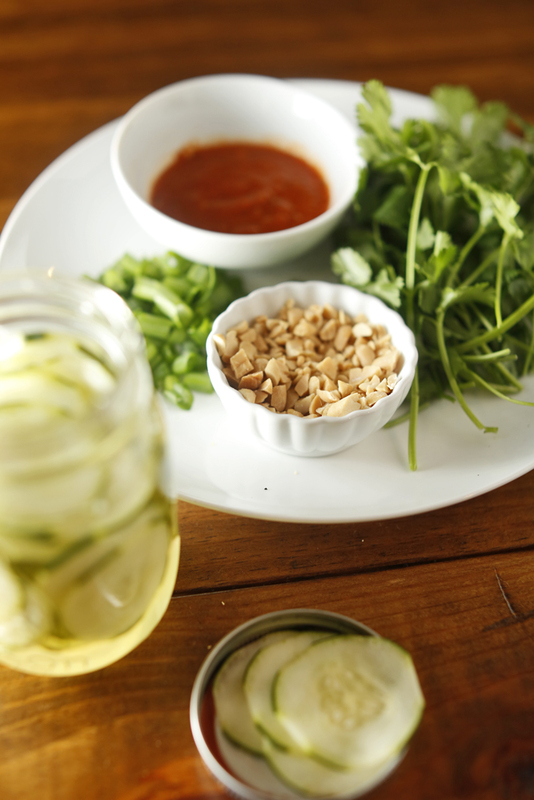 Do ahead: Make the Quick Asian Pickle and the Roasted Red Pepper Korean BBQ Sauce. Steam frozen buns in a parchment-lined bamboo steamer (or an other method you can dream up) for 10-15 minutes or until each bun is soft and pliable. 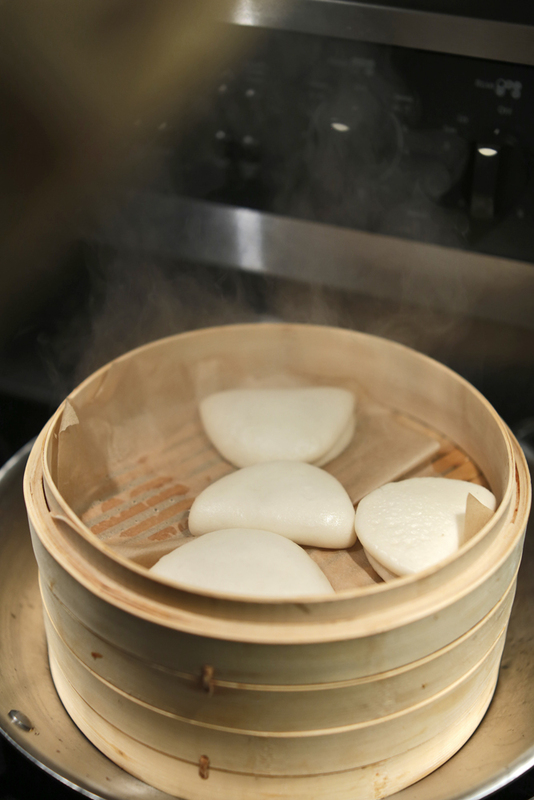 Hold in the bamboo steamer until ready to serve. In a large pan over high heat, heat the sesame oil and the canola until they start to smoke. Add the mushrooms to the pan in a single layer. Allow them to cook undisturbed for 3 minutes or until nicely browned on one side. Toss them around the pan and cook for another minute or two until mushrooms appear to be heated through. Add the Roasted Red Pepper Korean BBQ Sauce to the pan and toss to coat. Remove from heat and cover to keep warm until ready to serve. Place the cucumber slices into a pint jar. In a medium mixing bowl, whisk together the vinegar, water, salt, and sugar. Pour pickling liquid over the cucumbers, place a lid on the jar, and refrigerate for at least an hour and up to a week.